Elevate the dress to new heights! Fully lined dress has built-in cap sleeves, gathered skirt with scalloped side seams, and elasticized hem for bubble effect. Dress can also be made without scalloped sides. Share your photos on Instagram with the hashtags #osbubbledress and #oliverands. Girl's dress. Fully lined dress has drop-shoulder cap sleeves, gathered skirt with scalloped side seams, and elasticized hem for bubble effect. Dress can also be made without the scalloped sides. 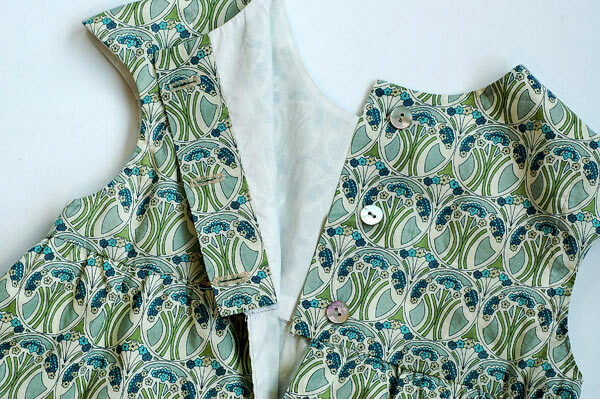 After successfully sewing this pattern, you will have developed the following skills: buttonholes, gathering, and lining. Designed for light- to medium-weight non-stretch fabrics like cotton broadcloth, batiste or calico, and lightweight linen, denim, chambray, or seersucker. Very light-weight non-stretch fabrics like batiste, voile or broadcloth. Thread, three 3/8" or 1/2" buttons, one yard of 1/4" elastic. Dress Length 16" 16 ½" 17 ½" 18" 18 ¾"
Dress Length 20 ½" 21 ½" 22 ½" 23 ½"
Chest 23" 24" 25" 26"
I have bought several PDF patterns, but this was my first Oliver + S purchase. I was pleasantly surprised at how easily the dress came together, and how quickly- it makes a perfect Easter dress for my 2 year old toddler. 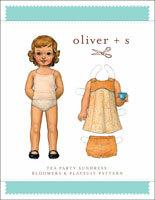 Will definitely sew this dress again, as well as consider other Oliver + S patterns in the future. I haven't sewn anything in a very long time, and this project was perfect for jumpstarting me back into it! I loved it!! 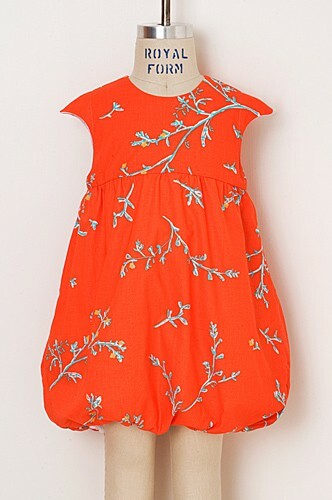 I knew I would like the dress, so it's no surprise that I actually love it and my little girl loves it as well. It came together pretty quicky even if I had to hand-sew the bodice to the gown after having tried 3 times with the sewing machine and different feet... it just wasn't working, especially as I wanted to insert some piping. I've already got some other version to try! I have now made three of these dresses! It is really fun to sew. Since it is lined, there are no exposed seams, giving this a very professional look. The instructions are very clear. 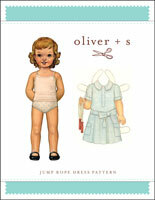 For extra help, I also followed the sew-along on The oliver + s blog. This was very fun to make. I took it to work to show it off and everyone thought I bought it. Shhh, I didn't let on how easy it was. I used a light seersucker fabric. Will be making another soon. Why have I waited so long?? Why have I waited to so long to make this adorable dress. A birth of a new granddaughter spurred me on to make this beautiful pattern. Easy to follow, simple to sew and an amazing outcome; this dress is sure to become a wardrobe staple. Great pattern. 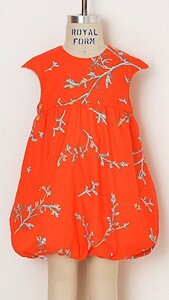 Used for baptism dress. I used this pattern to make a baptism dress for a friends daughter and it turned out beautifully! Surprising myself totally I have just completed this gorgeous little bubble dress. Yes, fully lined too. The instructions are so clear and straightforward that I was able to follow them carefully and hey presto I made the dress! My sewing skills are fairly basic but now I am excited about advancing on to something else. So IN LOVE with this pattern. I have made 5 dresses from this pattern and it's stunning! I love the sleeves and it sits so perfectly on my 5yr old and 1 yr old. I love the sleeves because it's perfect for a hot summer where the shoulders are not burnt yet the child isn't feeling too hot. Such a pretty party dress too and other mums at the parties have commented that its such a nice dress kids can play so freely and yet look stunning. Because this dress is lined, it looks as good a store bought dress. I was very wary of PDF patterns but Oliver +S has done it so clearly that it's so easy to follow... especially when I have never taken a dress making class before. Thank you! Who doesn't like a Bubble (dress)? Its completely adorable! From the delicious 'bubble' of the skirt to the dear little cap sleeves. The sweet semi-empire line to the ingenious back placket it is the perfect bundle of cute and clever design. I blogged a step-by-step tute if you would like a peep http://fiveandcounting-motherof5.blogspot.com.au/2011/01/bubbles-for-little-one.html Personally, the scalloped view is my favourite http://www.flickr.com/photos/motherof5/5399906341/in/set-72157625616566618 how cute is that? But if you prefer a more delicate look it sews up just as nicely in a dainty floral http://www.flickr.com/photos/motherof5/7087117417/in/set-72157625616566618 The yoke is simply begging to be trimmed http://www.flickr.com/photos/motherof5/5399905985/in/set-72157625616566618 and being fully lined it is as lovely on the inside as out. Go on, make a Bubble dress, you know you want to! Love this dress! I recently made coordinating bubble dresses for my twins birthdays, such a sweet result! It is a quick sew, with such a great, professional looking finish due to it being fully lined. I was so surprised at how quickly this dress came together despite being fully lined. 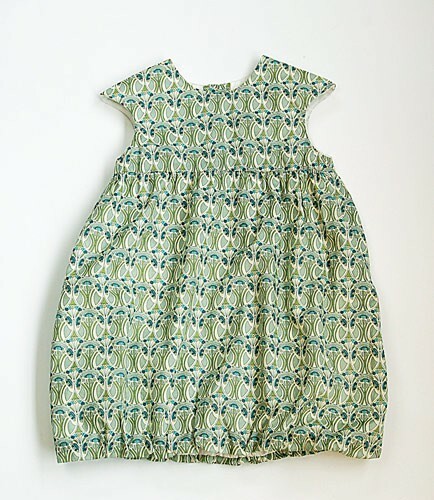 It is beautifully finished on the inside as well as on the outside, and is an adorable dress for a little girl. The bodice is a little roomy compared to ready-to-wear sizes; I could have sized down one size if I had really wanted to, but it still looks good - and she'll be able to wear it next year, too! Please note that this error has been corrected in the digital version of this pattern. This note applies only to the first printed version of the pattern. The first printed version of this pattern contained a small error. Piece #2, the Back Bodice, was missing a dot. The dot should be aligned with the second notch and located 1/2" from the lower edge. Discussion on the digital bubble dress sewing pattern from the Oliver + S Discussion Forums. Find and share more photos on Instagram using the hashtags #osbubbledress and #oliverands.